Here are genuine free census resources which allow you to search UK census records at no charge. As a professional family tree researcher, I use commercial services which allow me to view original census records so that I can verify that the census details are correct. However, subscribing to those services can be expensive, so here are some totally free census search sites to help you research your own family tree. If you are trying to find your elusive ancestor and unable to locate them in the free census searches, then I might well be able to help you. Please contact me if you would like some expert help searching censuses. Please note, the free census links will open in a new window, if you permit them to. FreeCEN Free UK Census records transcribed by international volunteers. Family Search Free census data from 1881 from the Church of Jesus Christ of Latter-Day Saints. Census Finder A directory of free online links to US and UK census records. GenoGold A good source to search free census records for six UK counties. Cornwall Online 1841 Free 1841 census records for Cornwall. Cornwall Online 1851 Free 1851 census records for Cornwall. Cornwall Online 1861 Free 1861 census records for Cornwall. Cornwall Online 1871 Free 1871 census records for Cornwall. Cornwall Online 1881 Free 1881 census records for Cornwall. Cornwall Online 1891 Free 1891 census records for Cornwall. Census Online Good source of free Workhouse census data, plus some more free UK and US records. 1901 census online Official 1901 census service for the UK, only provides very basic census data for free. Cotswolds Census Free census data for the Cotswolds, now sadly only available from the web archive. When you look at old census records you will find out the names of old trades and occupations which people undertook back then. These professions can seem very obscure today, and their titles are not always intuitive. So, when you find a bit of a puzzler don't forget to look it up in my online Dictionary of Old Occupations, where I have researched and published the definitions of way over two thousand old census occupations. 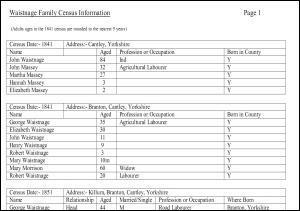 As I search through census records whilst researching a family tree, I find it useful to type up my census findings, because the original census records can be very hard to read. If you click either of the following two census thumbnails you can see examples of how I organise the census findings as I work. As a professional genealogist, I have access to better sources of census information than the free census searches listed above. If you would like me to help you search for your family records then please contact me , and I can save you some hard work. A census is a system for recording information about the population. The famous Domesday Book might be considered an early example of a British census. In the UK, a census takes place every ten years. The information is not normally made available to the public until 100 years have passed. 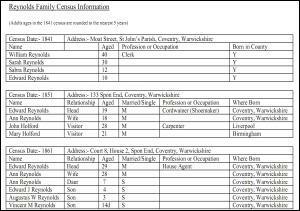 Census data can be a valuable source of information for a family tree researcher, because they contains names, dates, ages, home addresses, marital status, place of birth, occupations, certain disabilities and other records. Census information can be very hard to read, and in my experience the official transcripts can contain many errors. Where the census transcription work was 'off-shored' (i.e. done overseas) the results frequently seem to be mistranscribed into English. Therefore I always try to verify census findings by examining the original handwritten census records. The earliest UK census which tends to be of help to family tree researchers is the 1841 census, because it includes the names of household members. Later censuses give the relationship between members of the household. Be cautious when using the 'place of birth' data found in census records, because it is often inaccurate. Also, the ages of adults were rounded to the nearest five years in the 1841 census, but was given correctly from the 1851 census onwards. Birth registration records begin in July 1837, but registration was not compulsory until the 1870s. Birth registration records are a more reliable source of place and date of birth information than census returns. I can search the Civil Registration index of births for you, and obtain birth certificates for your ancestors. You can find more free family tree information on my family researcher website, so feel free to look around. Census records frequently reveal that ancestors worked in unfamiliar historical occupations. 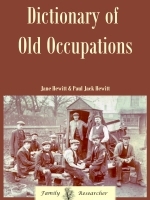 You can look up old occupations for free on www.familyresearcher.co.uk or you can buy my cheap ebook if you would like a legal offline copy for personal use. The National Archives' authoritative guide to its most popular set of records. The census has long been an important resource for family, local and social historians, yielding key information about our ancestors including their names, addresses, ages, family relationships and occupations. This one-stop guide covers everything you need to know about the 1841-1911 censuses in England, Wales, Scotland and Ireland, from the days of the enumerators knocking on everyone's doors to the modern privilege of internet access.